AirStrip Technologies was founded in 2003 by Dr. Cameron Powell, an ObGyn from San Antonio TX, and his partner Trey Moore, who is the software architect behind the products. Their first product, AirStrip OB was launched in 2005 and received FDA clearance in 2006. 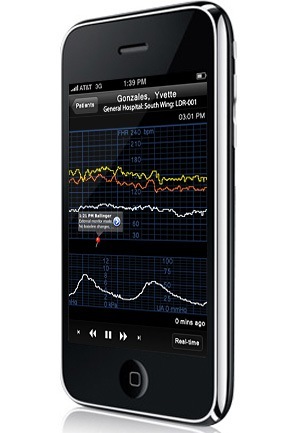 It allows for a physician to view the real-time fetal heart rate monitor of a woman in labor on an iPhone over a 3G connection. As Donna Morrow, RN, Vice President of Client Services told me, one of the least favorite parts of her job as a labor and delivery nurse was trying to describe a fetal monitor strip to a physician over the phone. When AirStrip OB came to her Houston hospital, she was an instant convert – enough in fact to leave her job of 15 years and join the company. The real breakthrough for the AirStrip Technologies came when Dr. Cameron was one of the featured presenters during the keynote address during the 2009 Apple Worldwide Developers Conference. In between the usual cadre of developers, suddenly walks on a physician. 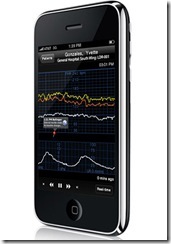 I remember gasping when watching his demo of a real-time display of a wave form an ICU. 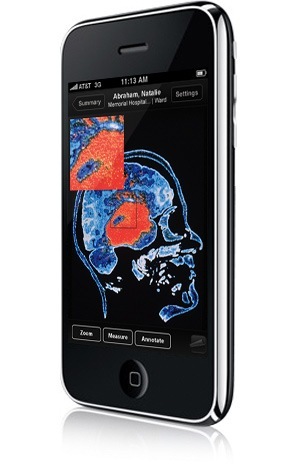 While eventually being able to view lab and other static data on the iPhone seemed predictable enough, actually seeing a real live patient’s heart beating on your phone was obviously a turning point for the iPhone platform and medical technology in general. Dr. Powell himself says that presentation was a turning point for his company in an interesting interview with HIStalk. He also says that the company made an early strategic decision to focus on highly refining the OB product before branching out into other opportunities. Importantly, the company invested in developing a robust application model that could be extended easily into other products. They refer to this as the AirStrip Remote Patient Monitoring (RPM) and it is, in effect, a platform that allows for the secure deliver of live streaming data that can displayed visually. Having engineered their product in a modular fashion and with a well-developed relationships with hospital-based monitoring technology providers, they are now able to roll-out a suite of applications on multiple smart-phone platforms. AirStrip CARDIOLOGY offers remote access to valuable data for the cardiologist including telemetry strips, EKG data, pulse oximetry, ventilator pressure measurements, end-tidal CO2 monitoring and arterial pressure monitoring. AirStrip CRITICAL CARE delivers ventilator flow tracings, patient vital signs data and rhythm strips. Practitioners can access virtual real-time and historical data. AirStrip IMAGING is a mobile PACS solution that can be accessed from virtually anywhere, providing practitioners with access to data previously accessible only at the bedside or on a hospital workstation. AirStrip LABORATORY provides on-demand access to lab results and readings via an HL-7 feed. Users can refer to current or historical results through the patient medical file by simply selecting the required results view. Ms. Morrow demonstrated the Critical Care product in the accompanying video and says FDA clearance is “imminent”. Even the quickest encounter will again show how amazing this will be to physicians. Multiple waveforms are displayed simultaneously, including ECG, blood pressure, pulse ox and temperature. Other screens will show laboratory data, I&Os. With a single tap, many of these parameters can be graphed over time, quickly showing trends over time. 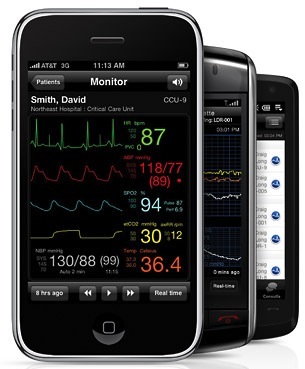 The interface is so fluid and accessible, I predict physicians will be standing at the bedside with all the hospital provided computers and monitors next to them and be looking down at their iPhones since it will be so much quicker and easier. Another key feature is that data is not stored on the iPhone, helping reduce security concerns. Physicians are able to review up to 4 hours of previous data. Worth noting, there is currently no capacity to enter documentation into the iPhone. AirStrip recently won a nationwide contract with HCA hospitals and is planning installation in 70 of their 110 hospitals. The OB and future Observer products are provided as a service, with the hospital paying a regular subscription fee. The pricing model for Critical Care will also be a strategic asset. The OB product is priced by the number of physicians. However, since several physicians can be involved in the care of a single ICU patient, the company is planning on pricing the Critical Care product on a per-ICU bed basis. What this will mean is that suddenly large cadres of physicians the in the hospital, across multiple specialties, will be using AirStrip Critical Care. It will not be long before they will be demanding the rest of the Observer suite of products for their own departments. Going forward, it will be cheaper anyway for hospitals to deploy software that individual physicians and nurses can use on their handhelds rather than trying vainly to keep up with with ever increasing numbers of dedicated fixed and portable computers, each needing maintenance and upkeep. 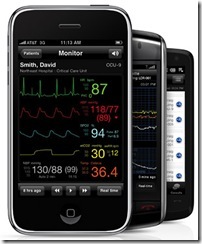 And thus, the next era of patient monitors may well be beginning. Can anyone tell me how much this is going to cost my hospital to implement? I’ve not heard anything back from the company when I sent an email months ago. Tell us how you like it ! I used the contact info above and it’s been several weeks now with no response. I haven’t called yet.